Canada has been caught up in the recent terrorism fervor that is making the rounds. 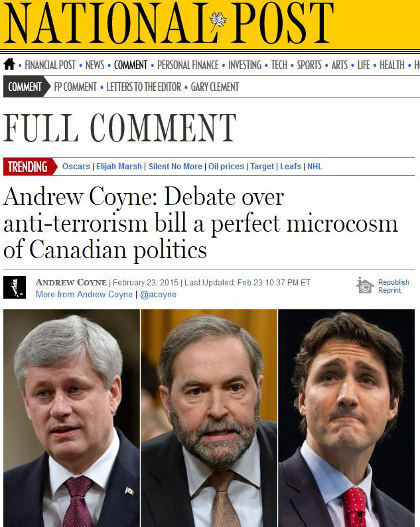 With the Canadian economy hitting a bit of a bump (thanks to low oil prices) the ruling Conservative Party has shifted focus to passing new anti-terrorism legislation that will likely make its way as part of their election platform later this year. Bill C-51 has raised a lot of questions about the extent to which it may be sacrificing the liberties of the Canadian people for some perceived security. Four former Canadian prime ministers (including a Conservative) and five former Supreme Court justices have warned Conservative Prime Minister Stephen Harper that protecting the security of Canadians and their most important freedoms is not a zero sum game. But like a lot of countries, the major political parties in Canada are on the same page when it comes to anti-terrorism legislation. Here the Conservatives and Liberals would likely bring forth the same law, with minor adjustments, but the same overall impact. For the second time in a span of just two days, Canadian soldiers have been targeted at home by terrorists. This latest incident from Ottawa is both sad and disconcerting when one considers the details. It is sad as the murdered soldier, Corporal Nathan Cirillo, was performing his duty as the ceremonial honour guard at the Tomb of the Unknown Soldier at the National War Memorial in Ottawa. The concerning aspect is that after murdering the Corporal, the gunman was able to walk right into the Centre Block of the Canadian Parliament unchallenged by police or security, where nearly all of the country’s Members of Parliament were preparing for meetings. He has been identified as Michael Zehaf-Bibeau, a Canadian born convert to Islam from Quebec who was known to Canadian authorities and possibly suffering from mental problems. The stone halls of Parliament Hill echoed with gunfire and were stained with blood Wednesday as a terrorist struck at the heart of the federal government after gunning down a sentry at the National War Memorial. The gunman was shot and killed near the Library of Parliament, according to Ottawa police sources, by House of Commons Sergeant-at-Arms Kevin Vickers, a former RCMP officer and the man responsible for security on the Hill. A witness said the gunman, carrying the rifle at his hip, walked deliberately up the west ramp of Centre Block and through the main doors of Parliament as bystanders cowered. It would seem that he could have killed a lot of other people on his way to Parliament Hill but may have desired to go after higher profile targets. Thankfully he was killed before being able to completely fulfil his terror attack. Initial reports stated multiple shooters involved but the Canadian authorities have been trying to steer this to a “lone gunman” incident over the last 12 hours. Even though a lot of incorrect information could be released in the initial chaos, it is also possible that they are doing this to understate the problem while efforts continue behind the scenes to apprehend other accomplices of Michael Zehaf-Bibeau. 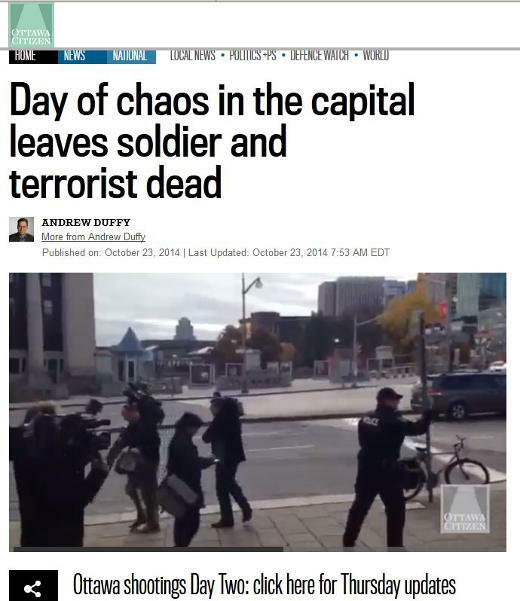 Unlike most terrorist attacks that tend to be perpetrated against general citizens, this once again targeted Canadian military personnel and sought to harm lawmakers. The impact this has on the latter – the Members of Parliament, their staff and other bureaucrats who were in the Parliament and surrounding area – will be worth monitoring as it could play a significant role in how counter terrorism policy is crafted in Canada. Will their direct confrontation with terror lead to stricter security laws, a clampdown on religious radicalization, reduced freedoms for Canadian citizens or changes in immigration policy? 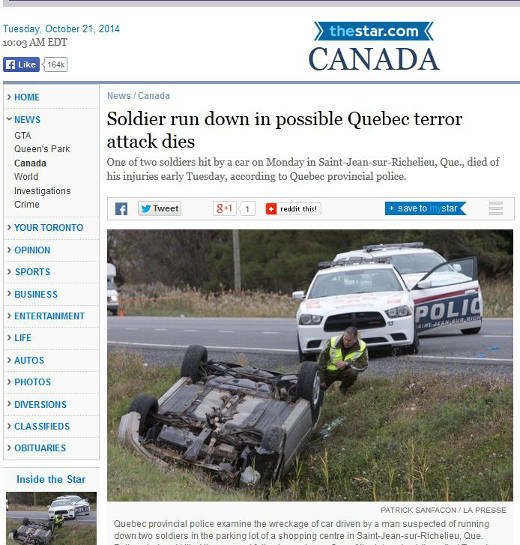 Two Canadian Armed Forces soldiers were intentionally run over by a car, driven by what is described as a “radicalized” man, in the province of Quebec. One of the soldiers succumbed to his injuries and the perpetrator (Martin Rouleau) was shot by police at the end of a brief car chase. It is being reported that Rouleau’s Facebook page identifies him as Ahmad LeConverti (Ahmad the Converted) who converted to Islam last year and was interested in the ongoing Middle East campaigns of the Islamic State. All of this happened with local police chasing him along one of the town’s main thoroughfares and into a residential area, where Rouleau lost control of his vehicle, flipped, and landed upside down in a ditch. He reportedly emerged from the overturned car with a knife in his hands, a threat that drew the gunfire of police. Though the method of murder is different, this targeting of soldiers does remind us of the 2013 Lee Rigby murder from Great Britain. Canadians next to give up some liberties, for a bit more security? The burgeoning threat from the Islamic State (IS/ISIS/ISIL) has resulted in new and proposed laws along with procedures and heightened security measures being enacted in Great Britain and Australia. It is being reported that Canada’s security complex may soon be getting some additional capabilities after raising concerns, that they were denied the ability to spy on Canadians suspected to have joined terrorist and extremist causes abroad. Proposed legal amendments will allow the Canadian Security Intelligence Service (CSIS) to expand its surveillance powers and share information with allies, which we assume refers to the “Five Eyes” (Canada, United States, Great Britain, Australia, and New Zealand). Observers say amendments will have to be carefully crafted given that Parliament’s authority goes only as far as the borders. Most countries pass laws to cover their domestic spy agencies, but few related to foreign-focused espionage. Yet the explosion of Internet and spying technologies now allows intelligence operatives in Ottawa to monitor international communications, a practice that blurs the lines between foreign and domestic surveillance. 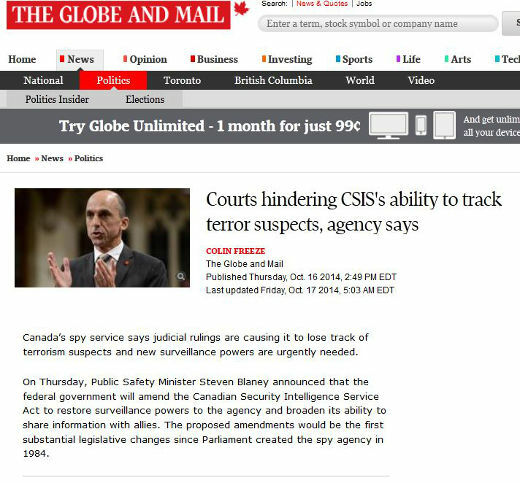 Just as police need warrants to conduct searches, CSIS must get permission from judges to spy on people in Canada. In 2009, Federal Judge Richard Mosley granted the first warrant for the agency to track Canadian terrorism suspects abroad. It will be interesting to see how this issue is debated within the Canadian parliament.